- to maintain therapeutic efficacy and life span of the constituents. - to prevent bacterial over growth. Whole blood and red cell concentrate must always be stored between 2°C and 6°C. A fall in temperature less than 2°C can cause freezing injury to the red cells leading to haemolysis. If haemolysed blood is transfused to a patient, it can lead to fatal consequences. Temperatures more than 6°C can lead to overgrowth of non specific bacteria which may have entered the blood unit during collections or component preparation. As red cells consume glucose for their continued metabolism, storing a blood unit at 2-6°C will also decrease the rate of glycolysis. FFP is usually transfused to restore or to maintain the clotting mechanism or as a volume replacement when crystalloids and colloids are not used. 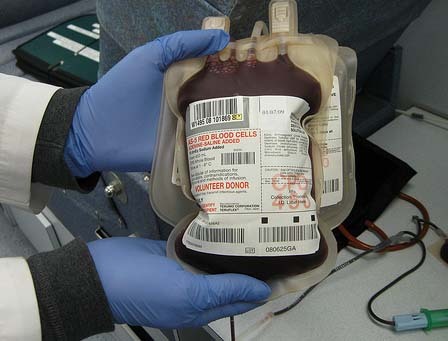 Fresh frozen plasma is prepared by removing plasma from a unit of blood within 6 hours of collection and snap freezing at -70oC and storing at - 30C. The speed of freezing is very important for maintaining the coagulation factors such as F VIII and F V.
Liquid plasma can be stored frozen at - 30°C or lower as plasma which has adequate amount of plasma proteins lacks the labile coagulation factors FVIII and FV. The shelf life of fresh frozen plasma and frozen plasma is one year. Platelets are usually stored as concentrates. They are harvested from a single unit of blood either from PRP (platelet rich plasma) or from buffy coat and resuspended in 50 ml of plasma. Platelets should be stored at 22°C in plasma under conditions in which the pH is maintained at values above 6.8. Temperatures below 200C during platelet preparation and storage cause a striking increase in the number of large aggregates in the platelet-rich plasma. A fall of pH of platelet concentrate due to lactate production from platelet glycolysis leads to loss of viability. Shelf life of platelet concentrate is only 5 days. Platelet concentrates must be gently and constantly agitated either on a flat bed agitator for better viability. Without agitation, there is a rapid fall in pH, due to collection of lactic acid metabolites. The conditions of storage will invariably produce changes in the physical and chemical properties of blood and blood components and in turn effect the red cell recovery. The red cell is dependent on anaerobic glycolytic pathway for the formation of ATP, which plays a central role in determining its viability and maintaining its shape. During preservation the metabolic cycle must continue in vitro for red cells to remain viable with adequate post transfusion survival and function. 2,3 DPG is known to profoundly lower the affinity of hemoglobin for oxygen at concentration found in red cells. Depletion of 2,3 DPG in stored blood temporarily adversely affects oxygen release by hemoglobin. In almost all cases cells that survive 24 hrs will remain viable and circulate for the remainder of their expected life span. Maximum allowable storage time, referred to as shelf life is defined by requirement of 70% recovery at 24 hrs i.e. at least 70% of the transfused red cells remain in the recipient’s circulation 24 hrs after transfusion. One of the most important factors influencing red cell recovery after blood storage is the anticoagulant solution used. A.Trisodium citrate: Rapid deterioration, only 50% cells viable after 1 week. B.Heparin: Rapid deterioration and an added disadvantage of being progressively neutralized by plasma therefore, most unsuitable for storage. C.Acid Citrate dextrose: Storage/viability for 28 days, 24 hrs survival of 77%, DPG level better maintained at 1 week because of the favourable effect of higher pH. D.Citrate phosphate dextrose: Storage/viability for 28 days, 24 hrs survival of 77%, DPG level better maintained at 1 week because of the favourable effect of higher pH. E.Citrate phosphate dextrose-adenine: Storage/viability 35 days - improved storage due to adenine which maintains high ATP level in the RBC. There is a gradual fall in pH during storage due to accumulation of lactic acid. Optimum storage temperature for whole blood and red cells is between 2°-6° with occasional elevation to 10°C (e.g. during transportation) being acceptable. Delaying refrigeration increases the loss of 2,3 DPG over this period. Platelets and granulocyte retain better function when stored at room temperature. Labile coagulation factors in plasma are best maintained at temperature of -30°C or lower. Refrigeration and freezing additionally minimize proliferation of non specific bacteria that might have entered the unit during venepuncture. The only important electrolyte change in stored blood is that of K. During blood storage there is a slow but constant leakage of K+ from cells into the surrounding plasma. In severe kidney disease even small amount of K+ fluctuations can be dangerous and relatively fresh or washed red cells are indicated. Due to a higher K+ content of stored blood, blood < 5 days old is recommended for neonatal exchange and top-up transfusion. Labile coagulation factors, Factors V and VIll lose their activity by 50% within 48-72 hrs of storage in whole blood stored at 4°C. ‹ Should a donor be promised blood for free in case of need?